Donna Shirley has been speaking to the public since high school. She is noted for her dynamic, amusing and informative speeches on a variety of topics and is currently speaking several times a month to audiences ranging from a few hundred to a few thousand people. Since the landing of Mars Pathfinder and its rover Sojourner on the red planet in July 1997, Donna has appeared on CNN, ABC, NBC, the Discovery Channel, PBS, and a number of local and international television and radio stations. 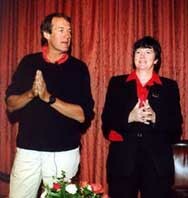 Donna Shirley and Charley Rose speaking at an executive workshop in Aspen, Colorado - September 1997. Courtesy of Alice Koelle Photography. The building of a Mars Rover. Mars in Fact and Fiction. Goals and Strategies for Human Exploration of the Solar System. The History of Robotic Space Exploration. Employer Sponsored Child Care - Key to the Future. The Public Policy Process: Why Policies Succeed and Fail. National Collegiate Inventors and Innovators Alliance, Managing Creativity Workshop, Washington, D.C.
Space Day Webcast, Mars Exploration, National Air and Space Museum, Washington, D.C.